Short Scenic drive form Pokhara. Panoramic view of Annapurna Ranges. Visit famous Hindu Temple with dry terrain. Scenic flight over Kali Gandaki river and Valley to Pokhara. Explore the best of mustang region situated in the north western Nepal with jomsom muktinath trekking package. It is an amazing blend of pilgrimage and adventure. 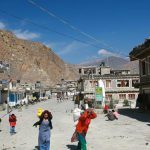 As name suggests, jomsom muktinath trekking takes us to mystical Tibetan influenced Jomsom valley along the famous pilgrimage site muktinath. Furthermore the trek is not ideal for pilgrims only. However it is also best for those seeking adventurous trekking in the Himalayas with natural and cultural beauty. 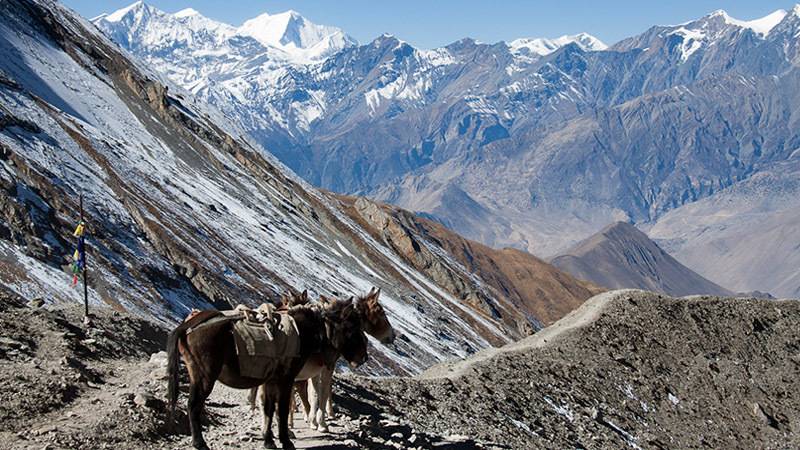 So ,jomsom muktinath trekking offers amazing Himalayan views. The trekking trail passes through stunning landscapes, lush forests decorated with rhododendrons and world’s deepest Kaligandaki gorge. Along the trail, you admire the breathtaking views of Himalayan peaks including Annapurna, Nilgiri, Dhaulagiri and several others. 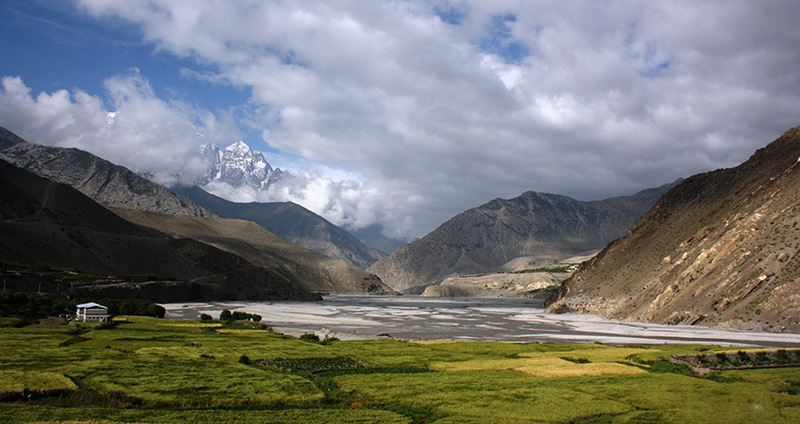 Apart from Himalayan views, the other highlights of Jomsom trekking are amazing landscape. Similarly it includes rocky cliffs, caves, scintillating scenery, old artistic monasteries, picturesque villages of local people, cultural encounter and opportunity to visit sacred Muktinath. 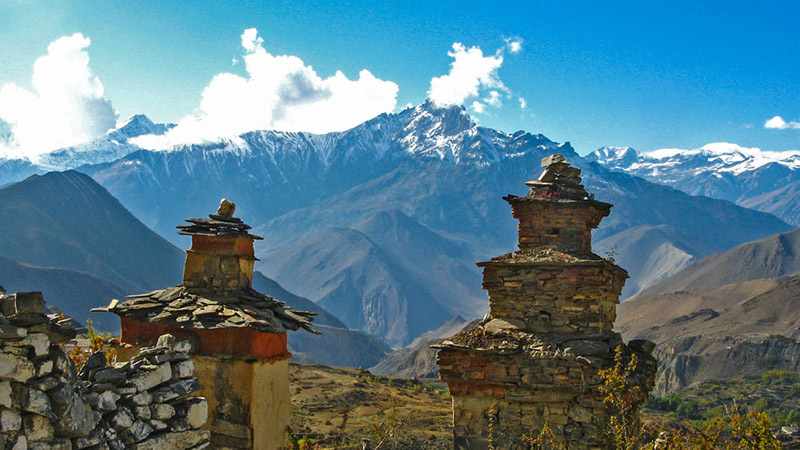 Our jomsom muktinath trek of 14 days begins after your arrival in Kathmandu. After completion of necessary preparations and sightseeing tour, we take a scenic drive to Pokhara. It is one of the major destinations of tourists traveling Nepal. Next day, we take a short drive from Pokhara to Lumle from where our actual trek (walk) begins. We pass through the terraced fields, meadows along the crossing of Bhurungdi and Modi River. The trail passes through Tikhedhunga to Ulleri, which is quite difficult involving the 3000 steps to reach Ulleri.Generally the walk is rewarded by the magnificent Himalayan views of Mt. Annapurna south and Himchuli Himal. Further our trekking adventure continues towards Ghorepani which gives an insight to local communities. It is inhabited by Magars surrounded by beautiful forests and Himalayas on the back drop. The trail further takes us to Tatopani where we will not miss to take a healing bath in natural hot spring. Passing through deep gorges of Kaligandaki river, we continue our trek to Marpha. It is famous for its apple farming and brandy. From there, the trail takes us to a beautiful windy village Kagbeni. Kagbeni, one of the most beautiful villages in the world will impress you and fascinate you with its beauty and charm. We leave Kagbeni to reach Muktinath, a famous pilgrimage site for Hindus and Buddhists. At muktinath you get to enjoy the windy and snowy muktinath weather . Similarly many pilgrims especially from Nepal and India become the part of Muktinath mustang trek to pay homage to Lord Vishnu, God of Salvation. After embracing the natural splendor around the Muktinath, we continue our journey to the deserted landscape to reach Jomsom. It is the headquarter of Mustang district. The approximate jomsom to muktinath distance by driving is 14.3 miles. 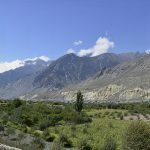 This Jomsom trek reveals the amazing diversity of Nepal offering the amazing view of deep valleys, high mountains and landscape resembling the Tibetan plateau. We finally board a flight to Pokhara and after some sightseeing there, we conclude our trip. With full of delightful trekking memories, we drive back to Kathmandu. In addition Jomsom Muktinath trek is graded as a moderate trek with muktinath’s altitude of 3710 m . Previous trekking experience is not mandatory but the trek requires good level of physical fitness. If you have experience of high altitude trekking, it will definitely be an added advantage. 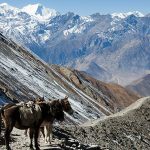 Hence ,mustang is in the rain shadow of the Himalaya, this trek is also suitable in the monsoon months (June to August) in addition to usual best times: spring (March-May) and autumn (September to November). Today we are going to head off to the famous lake city of Pokhara. The entire drive will take us about 7 to 8 hours to reach Pokhara from Kathmandu. We leave the noisy streets of Kathmandu and follow a winding roadway along the scintillating Trishuli river. Your eyes will be occupied by the views of green lush hills, small towns, people, markets and rivers. You can witness the first glimpses of Nepalese diversity of your trek while enjoying your drive. Later, after reaching Pokhara city, you and your friends will be escorted to your respective hotel rooms by our representative. With the closer view of Annapurna range and Mt. Machapuchare you will feel close to nature and mysticism. We arise in Pokhara and it’s our first morning in the wonderland of the iconic Pokhara city. A heart captivating view of snowcapped mountains awaits us as we begin enjoying our delightful breakfast. begin with yoga and meditation. From the roof of our hotel we can see the white caps of the mountains. Then, we head out to our bus or a jeep for a scenic hill drive to our next destination of the journey ahead. On the way to Tikhedhunga, you will pass through small town called Nayapul near a river. 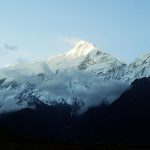 This place is popular mainly amongst those who plan to do a whole Annapurna Circuit Trek. As we start trekking, you can feel the region getting more beautiful and alive with each step you take. Furthermore, the path ahead becomes wider and relatively easy going with awe-inspiring natural sceneries. Soon, we arrive at Tikhedhunga village and end our day. Leaving Tikhedhunga village, today we are going to head towards another picturesque and well-known village called Ghorepani. Hence as soon as you finish eating your breakfast, your trek guide will have you carry your bags once again for a thrilling hike to Ulleri. And doing so will require you to walk on 3200 stone steps. This can be a bit hard for you at first. However, once you catch the rhythm, you will eventually find it alright to walk. One of the very important thing to do while hiking on these kinds of trail is that you must always make sure to take in the sights around you. The spectacular hills, blue sky, clouds and people around you will be a worthwhile sight to remember. Later we will begin to notice the environment changing around us from parsley scattered trees and farmlands to a more rain-forest like region. And then we will end our day by reaching Ghorepani. Even though Ghorepani is already a very stunning place to stay during our adventure trek. We surely can’t just walk away from Ghorepani without hiking up to Poonhill Trek (3,260m). Known for being the most beautiful hill viewpoint inside Annapurna region, trekkers hike up to Poonhill in large numbers for a mesmerizing sunrise view over the Himalayan massifs. After that, we shall have our breakfast and then continue our journey through a trail filled with Rhododendron forests. During our journey, we will be able to catch some iconic glimpses of Mt. Annapurna South and Mt. Nilgiri. We traverse past through several settlements like Sikham and Ghar Khola. Then, cross a suspension bridge before making our final ascent up to Tatopani. In definition, Tatopani is a village which has a natural hot spring that is liked by many trekkers. It’s day seventh and after spending an enlivened night at Tatopani village, we are now going to make our way to Ghasa village (2,110m). It will approximately take us about 6 hours to reach Ghasa village from Tatopani. The overall route will be easy to walk on with some gentle slopes and climbs along the scheduled path. Traversing past the deep gorge of Kali Gandaki river between two massive Himalayan mountains, we will reach Ghasa village. Ghasa village is a charming little Thakali village which calm the eyes of the trekkers with its exotic beauty. In addition to that, this village is a popular place for bird watchers as varieties of rare birds can be found living here. It is going to be a long day as we plan on heading to Marpha village from Ghasa. 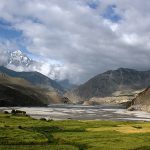 We will pass through several settlements and cross the Kali Gandaki river on numerous occasions. You can just take your time to enjoy all the diversity around you. Trekkers will get the opportunity to walk through the river banks and witness an ever-changing natural views. We go through Lete village after climbing through a steep hill through a forest and crossing Lete Khola. Then continue trekking further to the eastern part of Kali Gandaki and reach Larjung. From Larjung our trail leads us from Tukuche village and then ends at the windy western town of Marpha. Marpha is also known for its famous apple and many call it the “apple capital of Nepal”. This place also hosts a lot of tourist lodges and markets for trekkers traveling along the trek route. Today our trek will consist a mixture of road and riverbed of Kali Gandaki as we have to hike up to Kagbeni from Marpha. Trekkers will see the same arid, dusty and windy landscape that seemingly won’t stop until we reach Kagbeni. Only a few shrubs in the form of small green grasses and twigs can be seen around as we push ourselves further. We will have our lunch at Jomsom and then ascend further up to Marpha. Overall, we will cover an approximate elevation of 130 meter. Upon reaching Kagbeni, we will get inside our hotel rooms and then rest our bodies for the remaining days. To move towards Muktinath from Kagbeni we should start our journey by checking our special permit towards the Kali Gandaki riverbank. We will see striking natural sceneries as we make our way towards Muktinath temple. Many trekkers who go on the Annapurna Circuit Trek like us. 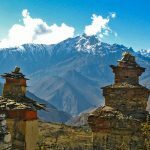 The path follows through the steep mountains directing the trail towards Khingar which takes us into a deserted landscape towards Jarkot village and further climbing up we reach to Muktinath, one of the famous pilgrimage destination for Hindus and Buddhist. Early morning, we will visit Muktinath Temple, of Lord Vishnu, one of the important Hindu deities. This temple is one of the important pilgrimage sites for Hindus and Buddhist as Buddhist in Nepal tend to believe Lord Buddha to be one of the reincarnation of Lord Vishnu. Thus, Buddhist Monastery is also situated nearby emanating the glow of religious harmony in Nepal. We will be enjoying the magnificent views of Mt. Dhaulagiri peak. From Muktinath we move towards Jomsom to the deserted landscape until we reach Jomsom. Jomsom also known as New Fort is a town located at an altitude of 2800m. 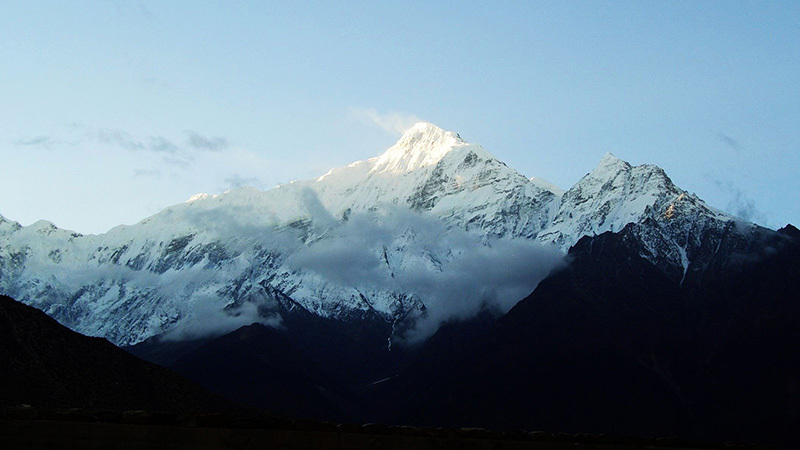 We can closely view the peaks of Dhaulagiri and Nilgiri from Jomsom which adds on to the beauty of Jomsom. After breakfast, we fly back to Pokhara between the gorge of Annapurna and Dhaulagiri where we will be transferred to the hotel. Known as the city of lakes and the starting point for trekking destination and the second largest city of Nepal is Pokhara. The Barahi temple in the middle of the big lake is the most fascinating landmark in Pokhara and the reflection of snowcapped mountain in the lake is so serene and magnificent that you will remember it for your entire life. With the closer view of Annapurna range and Mt. Fish tail you will feel close to nature and mysticism. The other destinations in Pokhara that you will not want to miss out on are Devin’s fall, Bindabasini Temple, Seti George, Buddhist monasteries and the hike to Peace Pagoda which brings you close to the nature and to the different spectrum of life style in this magnificent city. We will be visiting few places based on your interest. Our trek has come to an end and so we will now take a drive back to the Kathmandu city. Following the similar route through hills and valleys, we will reach Kathmandu in about 7 to 8 hours. Later in the evening enjoy Farewell Dinner. 14Days trek as per program with English Speaking Sherpa Guide and porter.